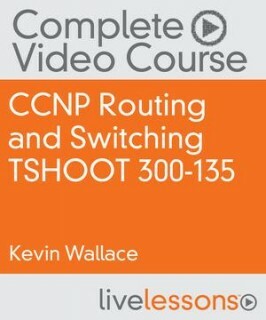 CCNP Routing and Switching TSHOOT 300-135 Complete Video Course HQ | Free eBooks Download - EBOOKEE! Posted on 2016-07-13, by 6_1_9. CCNP Routing and Switching TSHOOT 300-135 Complete Video Course is a comprehensive training course that brings Cisco CCNP R&S TSHOOT exam topics to life through the use of real-world demonstrations, animations, live instruction, and configurations, making learning these foundational networking topics easy and fun. Best-selling author, expert instructor, and double CCIE Kevin Wallace walks you through the full range of topics on the CCNP Routing and Switching TSHOOT 300-135 exam, including troubleshooting theory and procedures; network maintenance; resolving Layer 2 issues; troubleshooting IP addressing and basic routing issues; EIGRP, OSPF, BGP, and route redistribution troubleshooting; Cisco IOS features; and resolving network security issues. This unique product contains multiple types of video presentations, including live instructor whiteboarding, real world demonstrations, animations of network activity, dynamic KeyNote presentations, doodle videos, and hands-on router and switch CLI configuration and troubleshooting in real lab environments, allowing you to both learn the concepts and the hands-on application. The 95+ videos contained in this product provide you more than 9 hours of instruction. Modules are divided into easy to digest lessons and conclude with summaries and interactive module and glossary quizzes to help assess your knowledge. In addition to the review quizzes, the product also contains interactive exercises to help you truly learn the topics in each module. The product concludes with a series of troubleshooting case studies to help you apply the concepts you learned in earlier lessons and also provides a final preparation section with valuable advice to help prepare for the actual exam. Designed to take you inside CCNP troubleshooting concepts in a unique and interactive way, CCNP Routing and Switching TSHOOT 300-135 Complete Video Course is guaranteed to help you master the foundational networking topics that will help you succeed on the exam and on the job. Â· The troubleshooting toolkit, including change control procedures, managing configuration files, limiting show command output with modifiers, hardware diagnostic commands, and SPAN, NetFlow, and EEM configuration. Anyone interested in obtaining their CCNP Routing and Switching certification or anyone interested in learning fundamental network troubleshooting skills. No comments for "CCNP Routing and Switching TSHOOT 300-135 Complete Video Course HQ".